With more of us than ever looking to eat clean, get lean, and take matters into our own hands when it comes to our health and wellbeing, the trend for at-home food and drink prep is on the rise. Let’s think of the benefits: you know exactly what’s going in, you get to invent your own recipes, and you can save a fortune. It’s no wonder, then, that the healthy eating set swear by their juicers and smoothie-makers for a quick and healthy treat with no lurking nasties to throw them off course. So, you know the deal, but which one’s right for you? First, the difference: juicers strip away the fibrous bits from the fruit and veg that you put in, relegating the pulp to a separate compartment and leaving you with a clear, smooth juice. A smoothie maker, on the other hand, is essentially a blender, but usually with a bit more oomph to blitz hard-to-crack ingredients, including ice. While it all depends what you put in them, of course (hey, no-one’s stopping you making a margarita or Elvis-worthy milkshake with your machine), if you’re concerned about the health benefits, either go for an all-in smoothie maker, or look for a juicer that allows you to include more fibre, or one that macerates slowly to keep the good stuff intact. If you’re a busy bee who’s always on the go, look for models that come with travel cups, to get that goodness on your commute or workout and resist the lure of the snack trolley. Keep up your water intake too, with our round-up of the best water bottles. This multifunctional blender from VonShef gets a big thumbs up as our best all-rounder. It juices, grinds, and makes smoothies (not to mention cocktails and milkshakes, if you’re feeling a bit more devilish) in its generous 1L jug, and its strong stainless steel blades can go at two separate speeds or pulse at will. If you’re in a rush, you can take advantage of the included travel mugs. A really good buy for all manner of kitchen tasks, and at a frankly amazing price. This advanced juicer from Philips overcomes one of the biggest niggles first-time juicers have about the process, the mess, making it our best bet for time-starved users. This juicer’s big winner is its quick-rinse function: just pour water through and activate to quickly clean all the nooks and crannies. It’s also good for those concerned about the nutritional value of juicing, as the fibre boost option allows you to choose how much roughage to include, and the texture of your juice. For properly powerful juicing, look no further than the Braun Multiquick. 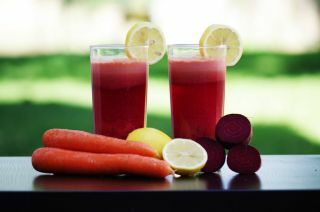 It’s incredibly quick, taking just 15 seconds to create a full glass of juice, and a smooth glass it is, too. The chute is large enough to take whole fruits, so you don’t have to faff around with chopping — just chuck them in, and let the two-litre pulp container collect the bits you don’t need. It also comes with a brush for easy cleaning. 150 watts of juicing power might not seem like much, but in the flavour stakes, as evidenced by this slow masticating juicer, it’s slow and steady that wins the race. If you happily spend the extra pennies on great-tasting produce, and don’t mind things taking a little longer for a superior flavour, this is without a doubt the juicer for you, as its slow and thorough pressing process retains more nutrients, and thus more taste. Foodies and fruit-lovers, stop here, but if you’re pressed for time, the Braun juicer may be more your speed. With its slightly scary 1500W of power and extra-strong pro extractor blades, the Nutri Ninja Blender Duo can blend everything, and we mean everything. Strong enough to break down whole fruits and seeds, and thus retaining more of the nutritional value, the blades create a smooth consistency for smoothies, purees and homemade butters, as well as crushing ice for yummy frozen drinks. You can also blend directly into the included travel cups, perfect for night-before prep or grabbing a drink on the go. With its budget price, variable-sized vessels and easy one-touch blending, this Breville blender is our best buy for busy families. This bundle comes with four individual bottles, so everyone gets their own, perfect for packing healthy snacks for school, running out to the gym, or satisfying cravings at work. The blades and bottles are dishwasher safe, and the plastic is BPA-free, so no nasties. The 300W motor isn’t the most powerful, but for blitzing small amounts of soft fruits, it’s ideal. If you’re crushing tougher fruit and veg and still need the portability, look to the Nutri Ninja. The little brother of the Nutri Ninja Blender Duo, this compact machine offers the same impressive blending in a smaller package, fitting easily into cupboards or sitting neatly out of the way on worktops. It doesn’t have a large jug attachment, just two single-serving cups with sip ’n’ seal lids, perfect for breakfasts on the go or a quick smoothie before a workout without risking spillage. If you want the pro power of the Duo, but don’t need the huge jug, this is a great budget-friendly alternative that you know will get the job done. On a health kick? Read our round-up of the best soup makers for healthy meals and snacks with minimal prep time.